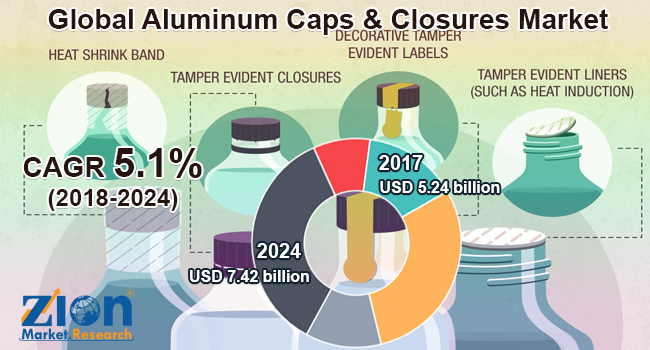 Global aluminum caps & closures market expected to reach USD 7.42 billion by 2024, growing at a CAGR of 5.1% between 2018 and 2024. The Aluminum Caps & Closures Market is driven by various growth factors, such as product differentiation and branding along with concerns about food, product security and safety, and reducing packaging sizes. The report covers a global and regional level estimation and analysis for the aluminum caps & closures market. The study provides forecast from 2018 to 2024 along with a historical data from 2015 to 2017 based on volume (Billion Units) and revenue (USD Billion). The study includes major drivers and restraints for the aluminum caps & closures market along with the impact they have on the demand over the forecast period. Additionally, the report includes the study of opportunities available in the aluminum caps & closures market on a global level. For providing the users of this report a comprehensive view of the aluminum caps & closures market, we have included product portfolio of key vendors and a detailed competitive scenario. To understand the competitive landscape in the market, an analysis of Porter’s Five Forces model for the aluminum caps & closures market has also been included. The aluminum caps & closures market report covers an in-depth study of the global and regional markets and market attractiveness analysis, wherein type, application, and regional segments are benchmarked based on their growth rate, general attractiveness, and market size. The study provides a decisive view of the aluminum caps & closures market by segmenting the market based on type and application. The market is estimated from 2018 to 2024 and all the segments have been analyzed based on future and present trends. By type, the market has been segmented into roll-on pilfer-proof caps, easy-open can ends and non-refillable closures. By application, this market is segmented into beverages, food, home, and personal care, and pharmaceutical. The regional segmentation includes the current and forecast demand for North America, Europe, Asia Pacific, Latin America, and the Middle East and Africa. The key manufacturers operating in the global aluminum caps & closures market are Amcor, Crown Holding, Closure Systems International, Silgan Holdings, Herti JSC, Guala Closures, Torrent Closures, Alcopack Group, Cap & Seal Pvt. Ltd., and Federfin Tech S.R.L.